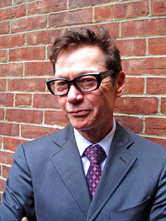 Jack Gantos is the “Exquisite Corpse Adventure’s” Mystery Author and was born in Mount Pleasant, Pa. He remembers playing a lot of “pass the chalk” in Mrs. Neiderheizer’s class in first grade. He was in the Bluebird reading group, which he later found out was for the slow readers. To this day he’d rather be called a Bluebird than a slow reader. His favorite game at that time was playing his clothes were on fire and rolling down a hill to save himself. When he was 7, his family moved to Barbados. He attended British schools, where there was much emphasis on reading and writing. Students were friendly but fiercely competitive, and the teachers made learning a lot of fun. By fifth grade he had managed to learn 90 percent of what he knows to this very day. When the family moved to south Florida, he found his new classmates uninterested in their studies, and his teachers spent most of their time disciplining students. Jack retreated to an abandoned bookmobile (three flat tires and empty of books) parked out behind the sandy ball field, and read for most of the day. His greatest wish in life is to replace trailer parks with bookmobile parks, which he thinks will eliminate most of the targets for tornadoes and educate an entire generation of great kids who now go to schools that are underfunded and substandard. The seeds for Jack’s writing career were planted in sixth grade, when he read his sister’s diary and decided he could write better than she could. He begged his mother for a diary and began to collect anecdotes he overheard at school, mostly from standing outside the teachers’ lounge and listening to their lunchtime conversations. Later, he incorporated many of these anecdotes into stories. In junior high he went to a school that had been converted from a former state prison. He thinks the inmates probably fled for their lives once the students showed up. Again, he spent most of his time reading on his own. In high school he decided to become a writer. But he would have to wait another three years, until he went to college, before he could actually meet other writers and study with teachers who thought writing amounted to more than just cribbing book reports and composing sympathy notes. While in college, he and an illustrator friend, Nicole Rubel, began working on picture books. After a series of well-deserved rejections, they published their first book, “Rotten Ralph,” in 1976. It was a success and the beginning of Jack’s career as a professional writer. This surprised a great many people who thought he was going to specialize in rehabilitating old bookmobiles into housing for retired librarians. His publications can take a reader from “cradle to grave” — from picture books and middle-grade fiction to novels for young adults and adults. Gantos is known nationally for his educational creative writing and literature presentations to students and teachers. He is a frequent conference speaker, university lecturer, and in-service provider. His novel for adult readers is “Zip Six,” and he has a novel that is forthcoming. For more information about Jack Gantos, visit his website at www.jackgantos.com (external link).